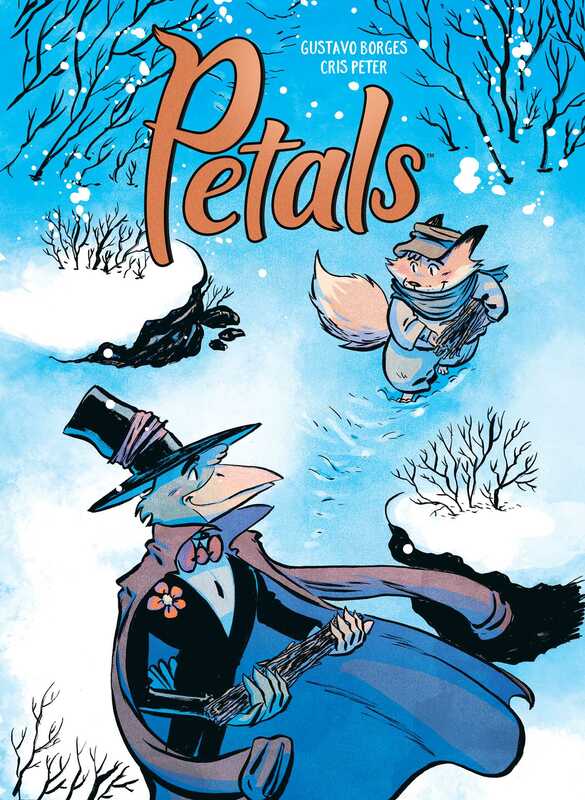 Petals is a silent comic that tells the story of a family of foxes whose life is transformed by the arrival of a strange visitor during a harsh winter. During a long winter two foxes, a father and son, try to survive the merciless cold but the father gets sick. In need of firewood, the young son ventures into the forest to grab what sticks he can carry and crosses paths with a tall and peculiar bird wearing a singular top hat. Making quick friends, the bird helps the young fox bring wood to his father and upon seeing the state of their house and their health, the bird decides to stay and help them with the winter. A beautiful and deeply touching story about friendship, selflessness, and death that shows us the true power of community and working together for a better place. Written and illustrated by Gustavo Borges and colored by Cris Peter, this wonderful tale is brought to life with vivid imagination and artwork that is accessible to all readers!